Each year, some 12 million tourists visit Niagara Falls to learn about its history, hitch a ride on the Maid of the Mist boat tour and take in the breathtaking scenery. In fact, after New York City, Niagara Falls is the second most visited place in New York state. However, none of these tourists get to view the falls from above, dangling from a cable, so close to the rushing water that splashes of moisture end up spraying their boots. 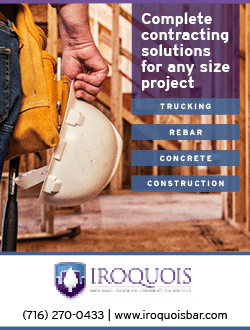 This isn’t part of a tour; but it was part of a job for Mark Cerrone Inc., a site contracting and construction company based in Niagara Falls, that specializes in complex projects. This particular job was a complete restoration of Luna Island, a small piece of land that separates the American Falls and Bridal Veil Falls. Cerrone was tasked with completely resurfacing the island, taking out invasive species of plants, and replacing them with flora that reflects the natural, historical populations. All existing pathways, railings and other man-made surfaces were excavated, removed and replaced with new paving and natural boulder walls, which act as seating while enclosing the redesigned plant beds. In a separate but similar project, Cerrone was integral to the construction of a new, American-based winter storage dock for the Maid of the Mist tour boats. It may sound less exciting than the Luna Island restoration project, until Churakos explains that this job required the company to lower a 100,000 pound excavator, mobile rock crushing plant and all of its materials, equipment and personnel 225 feet down into the basin of the Niagara Gorge. 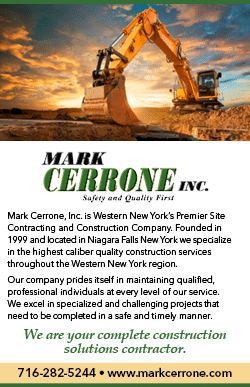 After working in the construction industry for over 25 years, Mark Cerrone, the company’s founder and namesake, endeavored to start a business with nothing but a dump truck and backhoe in 1999. Using the contacts he had amassed over the years, Mark picked up excavation, plowing and demolition jobs before taking on increasingly large and progressively complex projects, bidding on public work and also expanding the services offered by his company. According to George Lodick, Cerrone’s director of operations, the firm experienced predictable growth in its first eight years before tragedy clouded its future. Mark was diagnosed with cancer in 2006. He died at the age of 50 the following year. Heartbroken, but determined to carry on with the company, Stephanie, along with her husband George and Mark’s brother Vincent Cerrone, teamed up to buy the company at the end of 2008. Although the change in leadership would mark a new chapter for Mark Cerrone Inc., Churakos says nobody considered changing the company’s name. “It’s his legacy, which we are obligated and honored to carry on,” Churakos proudly states. In the last decade, Cerrone has exponentially grown its revenue from about $7 million to $75-80 million. Pieces like heavy roadway work, underground utilities, and asbestos abatement, all of which came into play on two recent projects. 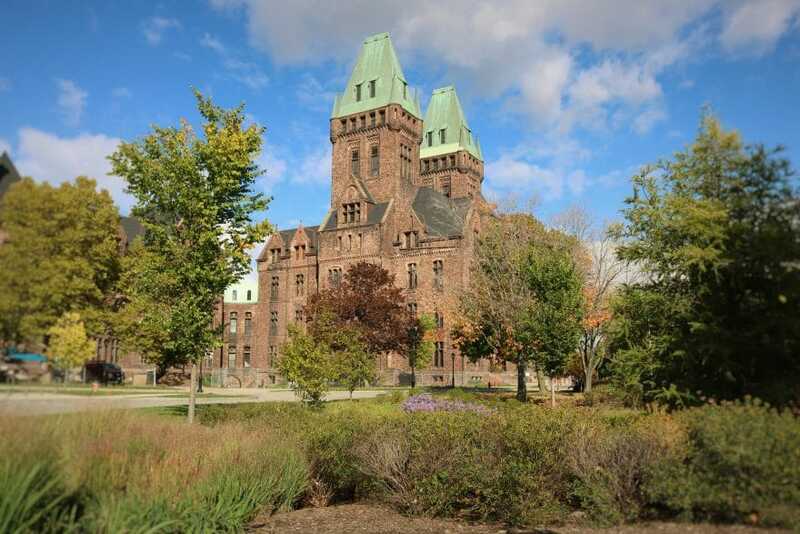 The first was an adaptive reuse of the Richardson Olmsted Complex, an iconic and imposing red Medina sandstone compound in Buffalo that was constructed in 1870 by architect Henry Hobson Richardson. This former psychiatric center was closed 40 years ago, but its main building was revitalized and reopened as the boutique Hotel Henry in May 2017—with some help from Cerrone. The company handled all of the site preparation and upgrades, including every part of the exterior from underground utility hook-ups to the driveways, curbs and landscaping. All this work was preceded a few years earlier by a massive interior abatement of asbestos along with everything that had been damaged and eroded by decades’ worth of water seeping into the structure. “There were sections where we literally had to cut out and rebuild the floor,” Churakos says. Just a few miles down the road is the result of another recent Cerrone project: the renovation of Buffalo’s downtown section of Main Street. Back in the early 1980s, the city decided to close down Historic Main Street to cars and install a light rail line. Based on the feedback of most residents, it prompted constant traffic jams, delays and significantly reduced available parking—all curbing local business. Twenty years later, cars returned to the thoroughfare with the renovations of Main Street’s 500 and 600 blocks, which were the responsibility of Cerrone. The city was so pleased with the result—which included work not just on the roads and new traffic patterns, but also the associated rail lines, stations, fountains and even some buildings—that the company just won the bidding for the 100 block, Lodick says. “Even if people don’t know we did the project, we can see that there’s something of value for the City of Buffalo,” he says. 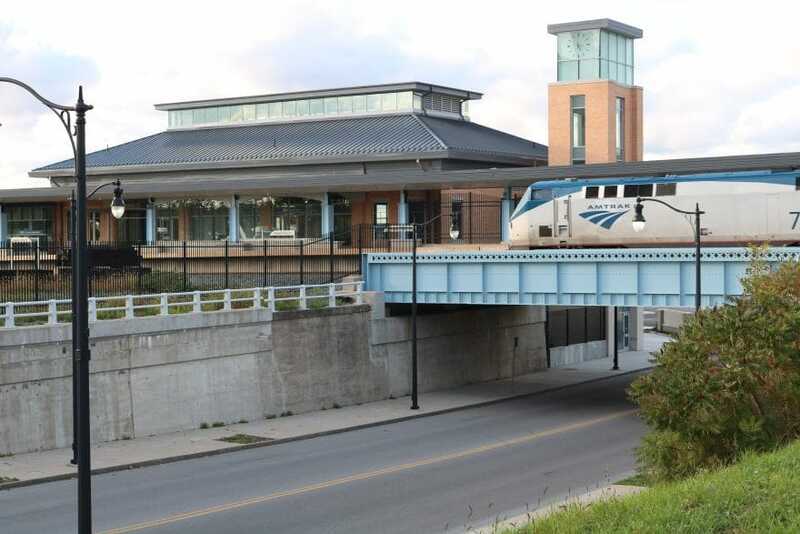 Cerrone is now finishing up work on Niagara Falls’ new Amtrak station, which Lodick says will serve as a much more appealing gateway to the city than the previous location and facilities. 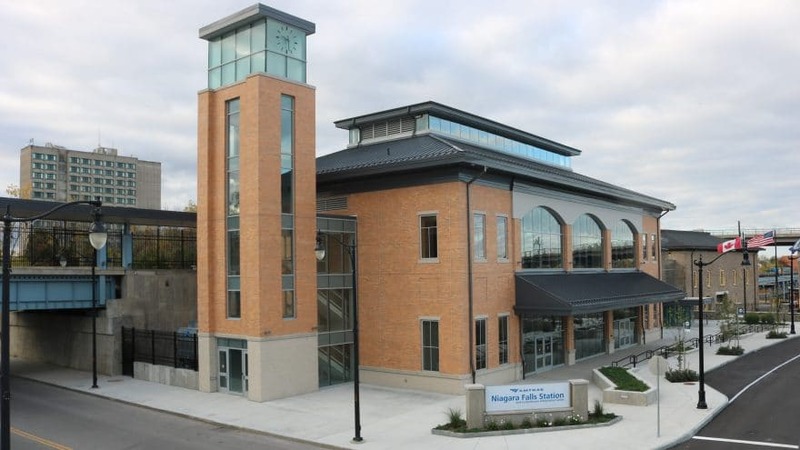 Using a long-shuttered customs house on the American-Canadian border as a starting point, the Scrufari Company of Niagara Falls led the construction team that created a new train station, which included a large glass atrium, clock tower and passenger platform extending onto a rail bridge. Cerrone contributed site preparation, foundation excavation, environmental remediation, utility installation, pavement and landscapes. Its railroad division is rebuilding a bridge deck and completely redoing the train lines to provide Amtrak service to not only Niagara Falls, but also from Toronto, Canada to New York City. “We have about 103 active projects today,” Lodick says, from a $5,000 industrial job to a $17 million landfill and $19 million roadway, throughout the state. Cerrone also runs a separate, 15,000 square foot maintenance and repair facility, a full-time trucking operation, and recently opened a satellite office in Rochester to manage project opportunities to the east. It has around 120 year-round employees which seasonal work can expand to 400 people. But Churakos is quick to emphasize that even with the expansions over the past 18 years, the company still has the same passion for Mark’s values, integrity and commitment to safety—even when dangling high above Niagara Falls.